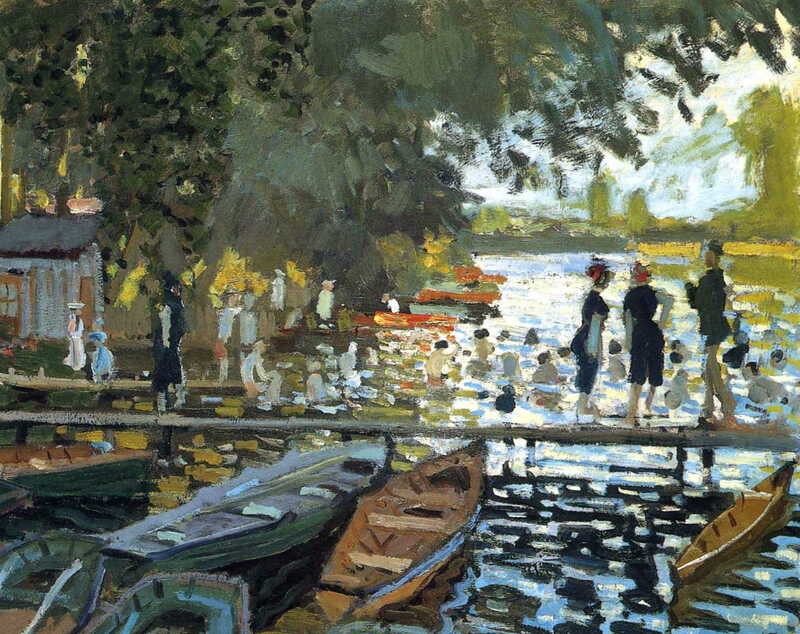 Beyond the French Impressionists: 27 What makes an Impressionist painting? 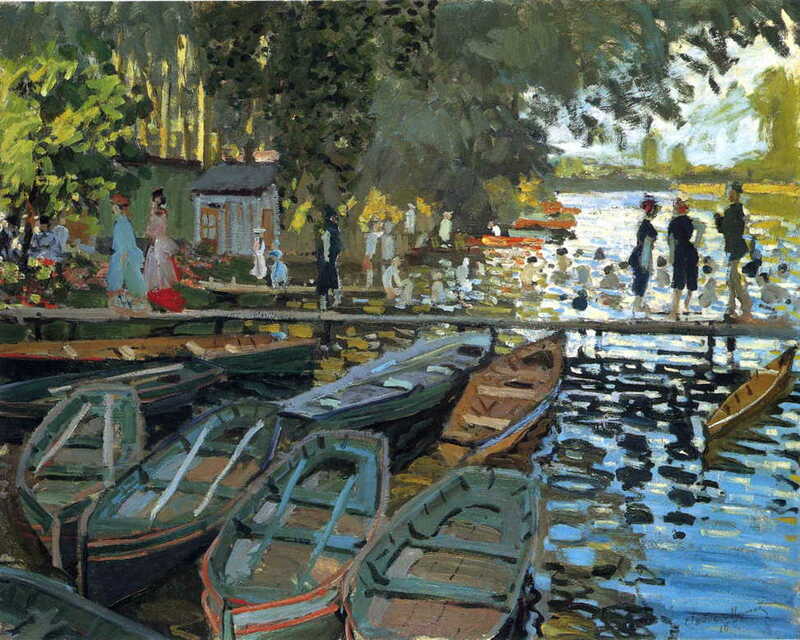 There are many and various opinions as to what makes an Impressionist painting, compared say with one from the Barbizon School, and how to distinguish between regular realism and Impressionism, for example. It is, of course, a central issue behind this series: what if most of those paintings that I have labelled as being Impressionist, or in impressionist style, were nothing of the sort? In the absence of any clearly articulated theoretical statements from the core French Impressionists, there are no obvious rules or clear criteria handed down. So before I try to make sense from the previous 26 articles, I think that it is important that I make clear what criteria I have used for the labels. These are based largely, but not solely, on Richard R Brettell’s book Impression: Painting Quickly in France 1860-1890, to which I have added details culled from many other eminent scholars, including John House, Richard Shiff, and John Rewald. However, any mistakes are definitely my own, and I welcome your comments. Although biographical information and critical analysis can be useful, I believe that, when judging whether a particular painter was an Impressionist or painted (possibly for a short period) in impressionist style, the only real objective evidence lies in their paintings. Even with artists whose opinions and works are very extensively documented and analysed, the second and sometimes sixth criteria can be very difficult to assess. As no-one came forward to give me sufficient funds to travel the world and inspect every painting featured in this series (I am still open to offers! ), I have tried to arrive at criteria which can be applied to decent quality and resolution electronic images – of the type that are available through the Google Art Project, other contributors to Wikimedia Commons, and WikiArt. These fall into four major categories, within which I ask a series of questions about the paintings. Does the painting appear to have been made in the studio, or mainly plein air in front of the motif? Although the French Impressionists did paint plentifully in their studios, in most cases they aimed to at least make their paintings of landscapes and other outdoor subjects appear to have been painted outdoors. We know that many of them, particularly Monet, Pissarro, Sisley, and Cézanne, spent long hours of most days painting plein air. Of course they were not the first to do so (contrary to the claims of some ill-informed commentators). 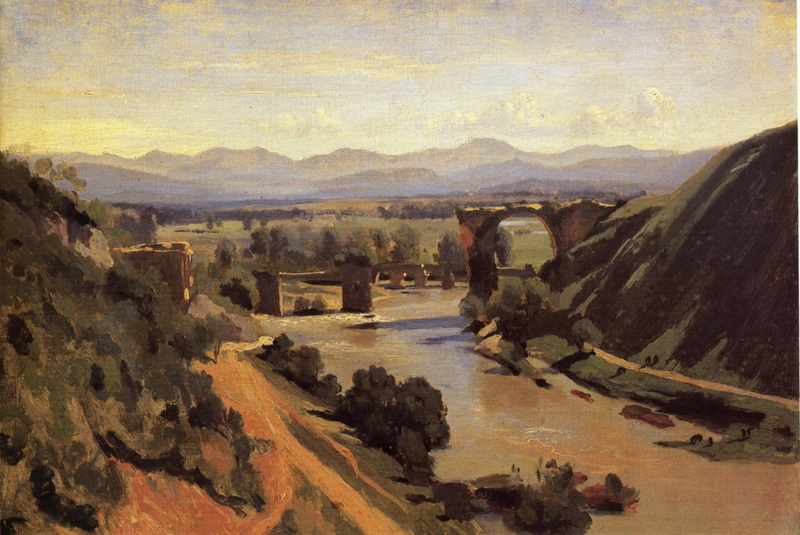 I have traced some of the earlier plein air painters here, for example, and Corot was particularly adept and prolific en plein air. But generally speaking most other plein air works were studies intended to be the basis of later studio paintings. The French Impressionists intended their plein air works to stand alone, and in many cases carried out further work on them in the studio, but still maintained their outdoor effect. This matches Brettell’s first criterion for an Impression. Is the support of canvas or wood panel? The French Impressionists largely painted on canvas supports, with some others (notably the Macchiaioli) preferring wood panels. Earlier plein air painters often used various types of board to support paper and other more delicate materials, indicative that those works were not intended to be exhibited or sold, but were primarily studies for later reference in the studio (cf. Brettell’s sixth criterion). This also weighs against watercolour, which was popular with other nineteenth century landscape painters, but relatively uncommon among the French Impressionists. Is it painted using oils? Although Cézanne and others did paint considerable numbers of watercolours, and Degas was one of the most accomplished pastellists in history, overall the French Impressionists worked in oils. The oil medium was also an indicator (although not proof) of the intention of the work to be completed for exhibition and sale (Brettell’s sixth criterion). Is the brushwork or knifework visible over significant areas of the painting surface? One of the most immediately distinctive features of precursors to Impressionism, Impressionism itself, and later styles and movements was that marks made by painting tools (brushes and knives) were left in the paint over much or all of the painting surface. These marks gave the paintings an ‘unfinished’ appearance in comparison with the beautifully smooth surface of Salon-style paintings of the time. William-Adolphe Bouguereau, Nymphs and Satyr (detail) (1873), oil on canvas, 179.8 x 260 cm, Sterling and Francine Clark Art Institute, Williamstown, MA. WikiArt. Such marks commonly appear in vegetation, the ground surface, and often the sky, even when there are no distinct clouds. Again these are not confined to the French Impressionists, but are almost universal in their paintings. Ideally they are best observed by looking at the painting at a shallow angle, or in raking light (the traditional phrase), but a good quality image should normally make this fairly clear. Marks and visible brushwork are not novel to this period. I have already drawn attention to their appearance in many of Rembrandt’s late works, and there are plenty of other classical painters who did leave them in some of their works. But such marks are almost universal in Impressionist paintings, as reflected in Brettell’s third and fourth criteria for an Impression. Are the details through the painting made up of brushwork or knifework marks, or have they been smoothed to appear fine? This assess the gestural nature of the marks seen in Impressionist paintings, as in Brettell’s third and fourth criteria for an Impression. 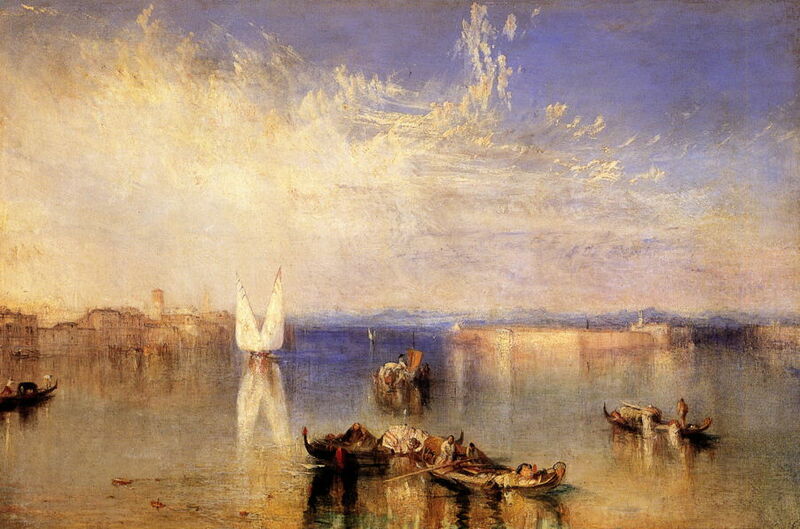 I have already noted how many of Turner’s more avant garde paintings lack gestural marks in foreground and other detail, which is an obvious distinction from Impressionist paintings. Are there areas where visible brushwork or knifework has been laid in patterns which are relatively independent of the form of objects? Most of the core French Impressionists, at some time or another, laid parts or much of their paintings using patterned marks. 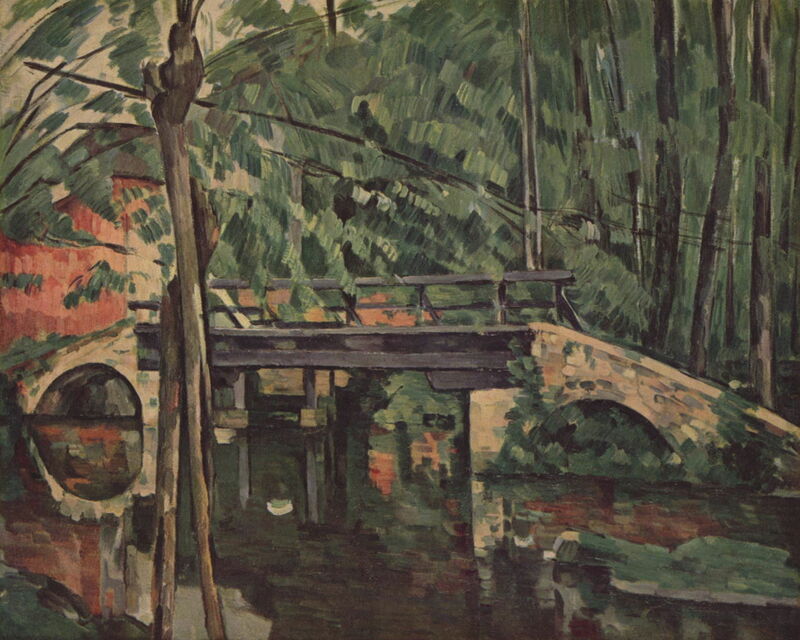 Perhaps the most obvious example is in Cézanne’s ‘constructive stroke’, as termed by John Rewald. Such marks are very unusual in previous or contemporary painting practice which is not Impressionist, although they have been adopted in Post-Impressionist and modernist styles. This also reflects Brettell’s third and fourth criteria for an Impression. Are there substantial areas of high chroma colour? Although not featured in all paintings by core French Impressionists during the period of ‘high Impressionism’ from the 1870s, the use of high chroma colours, such as brightly pigmented paint straight from the tube (or bladder), is very common among most. Brettell argues against it being a criterion of an Impression because of its lack of universality, but when using a set of more flexible criteria (none of which is mandatory) I consider that it is an important inclusion. Are there substantial areas depicting sunlight or other incident light, or its optical effects? Another property which is neither universal among paintings by core French Impressionists during the period of ‘high Impressionism’, nor confined to them, I consider this an important inclusion. Are the painting’s main appearances those caught in a moment, or transient? This is the nub of Brettell’s fifth criterion for an Impression, although far from universal in paintings by the core French Impressionists. Does the painting show subjects not from traditional genres, such as mythology, biblical stories, Roman or Greek classics, and similar? If there was one open intent of Manet and among Impressionists, it was to develop genres more contemporary than those conventionally seen in the Salon. Are there themes in the painting which show contemporary technology, scenes, or activity? Again this is a subject which recurs throughout the literature on the French Impressionists, and I believe an important consideration. Does the whole painting appear as if it was captured spontaneously? This is more subjective, but an important consideration embodied in Brettell’s fifth criterion for an Impression. 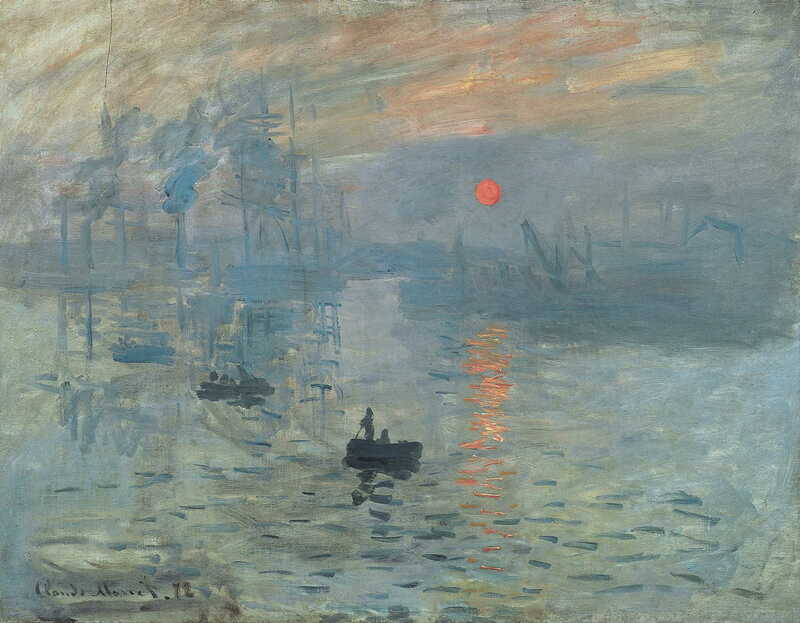 The results for Monet’s Impression, Sunrise (1872) give a total score of 12/12. It appears to have been painted plein air, is on canvas and in oils, has brushwork visible throughout the surface, its details are generally broken apart from the central small boat, patterned strokes are visible in the sky and water, it has quite high chroma particularly in the sun and its reflections, the whole painting depicts dawn light, it is a very transient effect which is shown, it does not show a classical motif, it shows smoke from factory chimneys and dockside cranes, and gives a strong feeling of spontaneous capture. 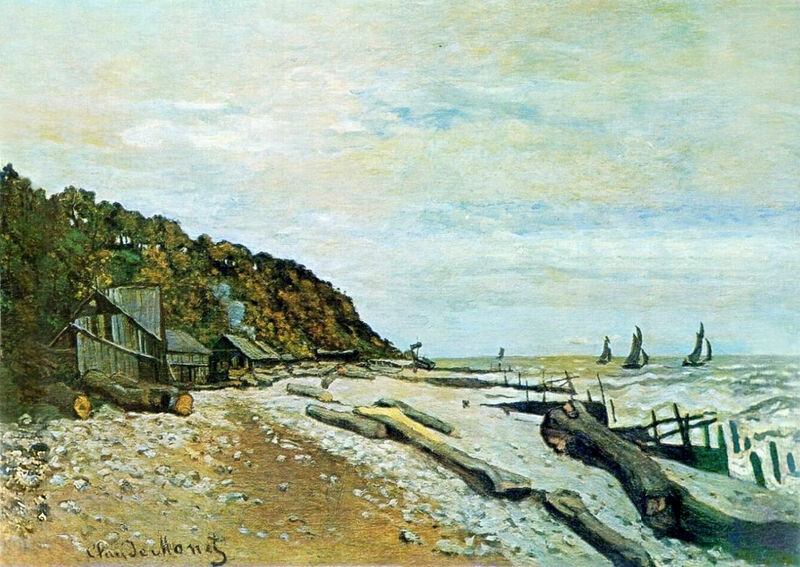 However just five years before he painted Bathers at la Grenouillère, Monet’s Boatyard near Honfleur (1864) reaches a score of only 5/12, obviously falling short in seven of the criteria listed above. The latter painting would therefore appear to be pre-Impressionist in style. In comparison, Bouguereau’s Nymphs and Satyr (1873) gives a total score of 3/12. 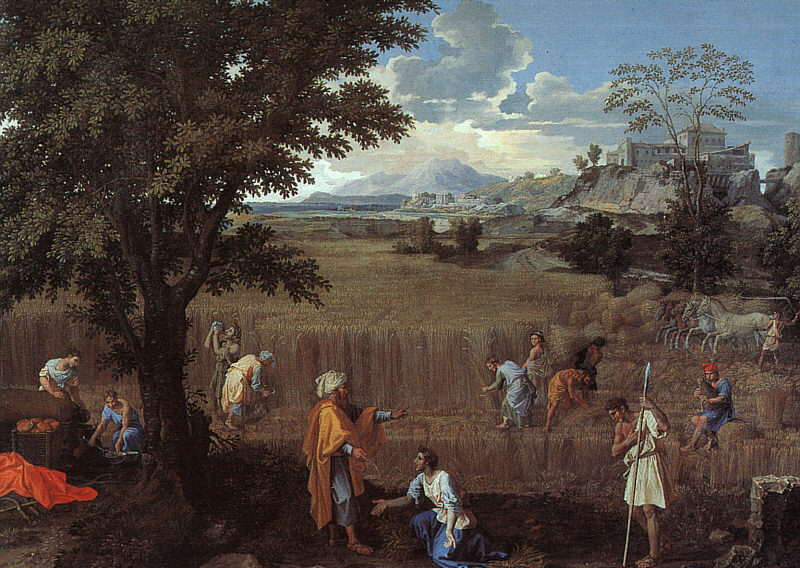 It was plainly painted in the studio, is on canvas and in oils, has no visible brushwork, its details are smooth and fine, there are no patterned strokes, it has low chroma, it does show the effects of light, the appearances are not transient (except in the freezing of movement), it is mythological in genre, there in nothing modern by way of theme, and it does not appear at all spontaneous in its capture. Ultimately someone may come along and perform formal statistical analysis, allowing these criteria to be weighted according to their importance as discriminators. However for the time being I hope that a simple evenly-weighted score will suffice. The next and final article in this series will use this scoring system to look at who painted the first works in impressionist style, and when, and how this style spread across the world with time. Brettell RR (2000) Impression: Painting Quickly in France 1860-1890, Yale UP. ISBN 978 0 300 08447 4. Shiff R (1984) Cézanne and the End of Impressionism. A Study of the Theory, Technique, and Critical Evaluation of Modern Art, U Chicago Press. ISBN 978 0 2267 5306 5. Posted in Painting and tagged Bouguereau, Brettell, Cézanne, Corot, Degas, genre, gesture, Impression, Impressionism, Macchiaioli, Monet, painting, plein air, Poussin, Rembrandt, Turner. Bookmark the permalink.